← Guardians of the Galaxy 2 is Definitely Happening! 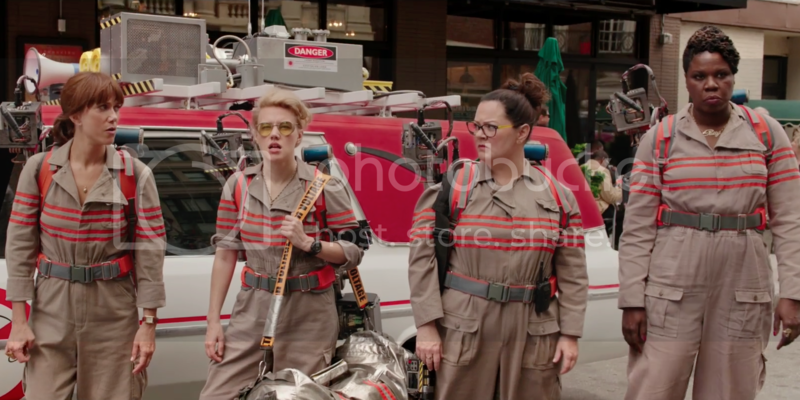 I ain’t afraid of no classic movie remake starring an all-female cast! Despite the legions of angry Internet trolls crying out against this movie, I have had zero qualms about seeing the new Ghostbusters and taking it at face value. I was a huge fan of both original movies, and an even bigger fan of The Real Ghostbusters cartoon series (and toys! ), but I wasn’t someone chomping at the bit for a Ghostbusters 3 or anything of the like. Still, someone went and made this new movie, I was happy to go see it, and I really enjoyed myself. The new Ghostbusters is a fun and quite funny movie. A lot of the jokes are pretty great, though there are always some duds. The main characters are all outstanding, with a great camaraderie and team style. Once the action starts to kick in, I think the movie goes a little bit too far off the rails for my tastes, but it’s still overall enjoyable. I’ve got some individual nitpicks here and there, but I’ll get to them later. The main thing to know about the new Ghostbusters is that it trades in the original film’s down-to-Earth realism for a more cartoony, action-focused style. Not to say it’s a cartoon come to life, but this movie can get pretty silly. Personally, the realism is what makes the original Ghostbusters such a classic, on a number of different levels. So I was a little disappointed that this new movie went for the cray cray vibe. But it worked in its own way, and that’s good enough. Also, I may get tarred and feathered for saying this, but Bill Murray was the worst part of this movie. Join me after the jump for the full review! There will be FULL SPOILERS. The appeal of the original Ghostbusters movie, at least for me, is in the grounded take on such a supernatural phenomenon. In order to combat the insane ghost invasion, you had a couple of guys in jumpsuits and homemade equipment rolling up their sleeves and getting their knees dirty. Yes, most of them were scientists, but they didn’t all act like stereotypical scientists. Egon, Ray, Peter and Winston were all relatable and human, using science and gumption to battle the forces of supernatural evil. The new Ghostbusters follows the same basic plot, but everything is dialed up to 11 this time around. The main draw of the new movie is the new cast, and they’re all fantastic in their roles. Kristin Wiig and Melissa McCarthy lead the way as Erin Gilbert and Abby Yates, and I’m a big fan of both actors. They’re routinely funny, and they create a couple of compelling leads here. 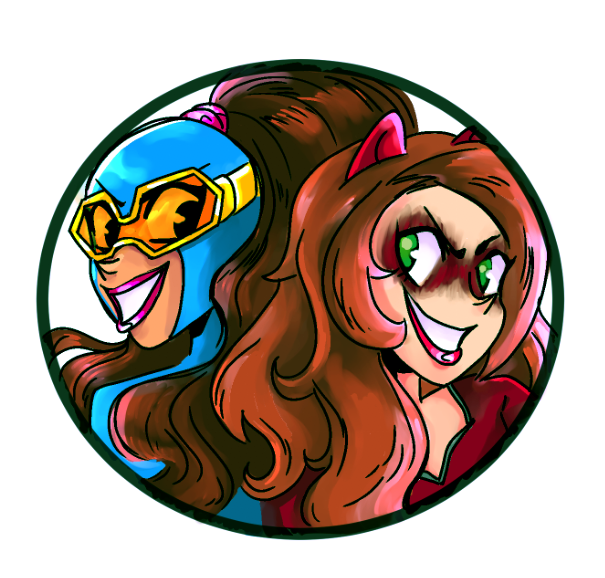 They were childhood friends who believed in ghosts, but grew apart as they grew up and pursued different career paths. The sudden arrival of the supernatural in Manhattan brings them back together and sets the team in motion. I wasn’t familiar with either Kate McKinnon or Leslie Jones prior to their casting in Ghostbusters, but they’re also really good as Jillian Holtzmann and Patty Tolan. Everybody gets some great jokes and solid characterization. 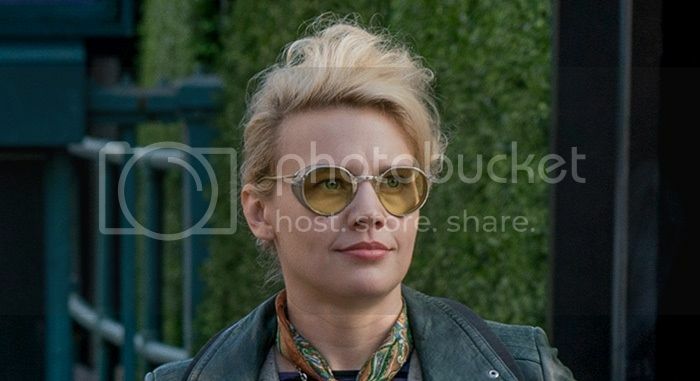 Personally, McKinnon’s Holtzmann was a standout. She’s the tech geek with a weird personality, given over to little gags and quirky behavior. I liked her a lot, and she’s quite funny. She also gets to design all their stuff, and I liked the focus the movie gave on actually building the Proton Packs step-by-step. She didn’t just have them at the ready, the team developed their equipment over time. Though while we’re on the subject of equipment, I was less interested in how the movie spent a lot of time introducing new gadgets. Among other gizmos, Holtzmann created a ghost-busting grenade, a power fist and a suction shredder. 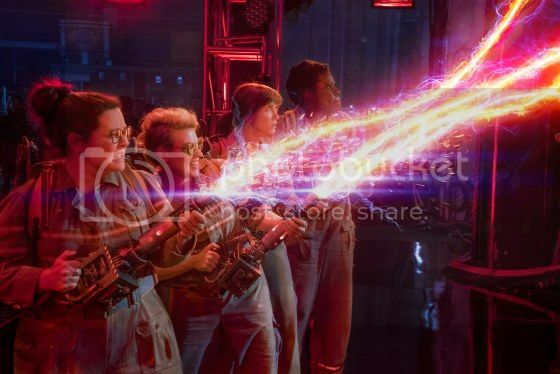 I’m all for new gadgets, but each one of them was given a ‘testing’ scene where the Ghostbusters try them out in the alley, only to then get the requisite scene in the big climax where they trot out the same weapons and use them once for their stated purpose. It was like the movie had a checklist of gadgets and just went down the list in the climax. Did we really need the earlier training scenes if they weren’t going to amount to very much? I dunno, I’m griping…and I’ll have a few more gripes in a bit. Overall, the movie is entertaining. Most of the jokes are hilarious, the main characters work well together, and the story is fine. I especially enjoyed the first half of the movie, which was all about bringing the team together and setting up the Ghostbusting. I felt that was really well done. They built a nice new world for busting ghosts. But then the story kicked in, and I felt the second half got a little too crazy. The reason that ghosts are suddenly appearing in New York is because a wormy dude named Rowan has invented devices that break through the barrier to the spirit world, and he wants to summon a whole bunch of ghosts to punish the city for being mean to him. The Ghostbusters just happen to be developing anti-ghost technology at the same time, and they’re all that stand in his way from destroying New York City in the end. 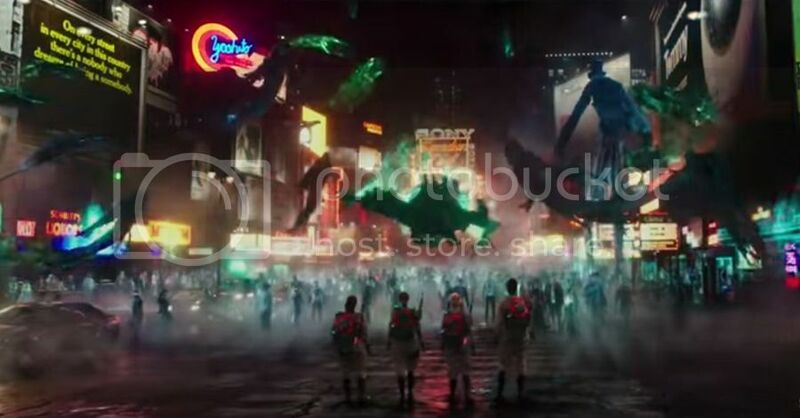 The climax of the movie is this huge battle in Times Square, where the Ghostbusters essentially get into a brawl with some big, neon ghosts. 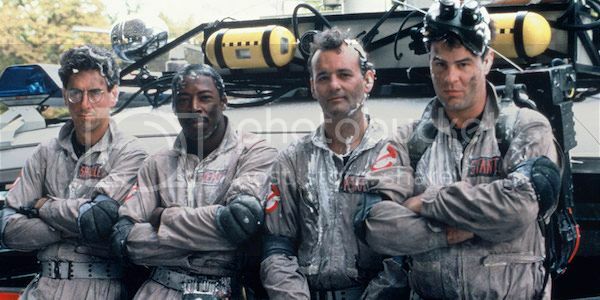 They’re a little hampered by the fact that Proton Packs are designed to trap ghosts, not destroy them. 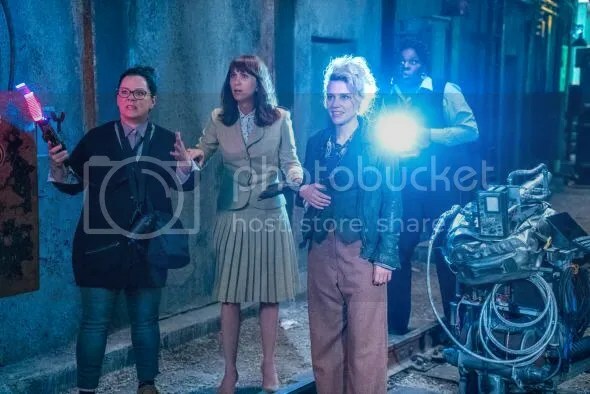 But like I said, Holtzmann invented a bunch of new equipment almost solely for the purpose of actually going on the offensive against the ghosts. It’s a flashy fight scene that really, really wishes the Proton Packs fired deadly lasers instead of containment beams. It was a big, crazy climax, and I suppose it’s fine, but it went a little too far for my tastes. The less said about that climactic rescue, the better. That looked cheesy as hell. Also, the movie kind of shoots itself in the foot. If you think about it, the reason there are ghosts in New York that need busting is because this one dude, Rowan, is summoning them from the other side. In the first movie, ghosts were just there, the same way we already believe ghosts could be around anywhere. In this new movie, there’s one specific threat with a simple explanation. So it’s not like ghosts are real and the Ghostbusters need to exist to stop them. It’s more like, this one dude is up to some crazy stuff, and it’s just a coincidence that Erin, Abby and the gang showed up with the exact right technology to stop him. Once Rowan and his ghost invasion are defeated, why even keep the Ghostbusters around? Although I guess it makes sense in that this team is more of a scientific unit rather than a business. Part of me was a little disappointed that they dropped the original movie’s concern with funding, but I guess this new team has a different premise. Just because Rowan’s ghosts are gone doesn’t mean somebody shouldn’t study the phenomenon to understand what happened. Look at that, I just wrote myself out of a nitpick. What do I want? An Ecto-Cooler? But don’t worry, I have more! I didn’t care for Chris Hemsworth as Kevin, the supremely dim-witted receptionist. He had a few funny moments, sure, but he was a little too cutely dumb for the movie’s own good. Also, during the climax, a big deal is made in a scene where Erin rejoins the team in the nick of time and saves them from a bit of danger. Everyone is glad to see her again, and it’s treated as if she has suddenly made a big return. But…Erin was just across town. After a bit of trouble with the mayor’s office, Erin seems to go home, while the others head to their HQ. Erin figures out the villain’s plan and tries to warn the mayor, while the others deal with the ghosts and then gear up to get ready for the climax. Why didn’t Erin just call any of them on their cell phones? Why didn’t they call Erin that they needed to go to work? The movie shows Erin calling the receptionist’s desk and getting an empty HQ, which is fine. But why don’t they have cell phones? Erin eventually catches up with the others and joins them for the climax, but her arrival isn’t some ‘big return’. She was just across town and didn’t think to text them to wait for her when they suited up. I dunno, it’s a weird nitpick. I kind of just wanted to state it on the record. But if we’re really talking nitpicks, I’ve got a doozy for you: I didn’t really like most of the callbacks or cameos from the first movie. We’re getting into sacrilegious territory here, folks. Proceed at your own peril. There were a lot of really good bits. 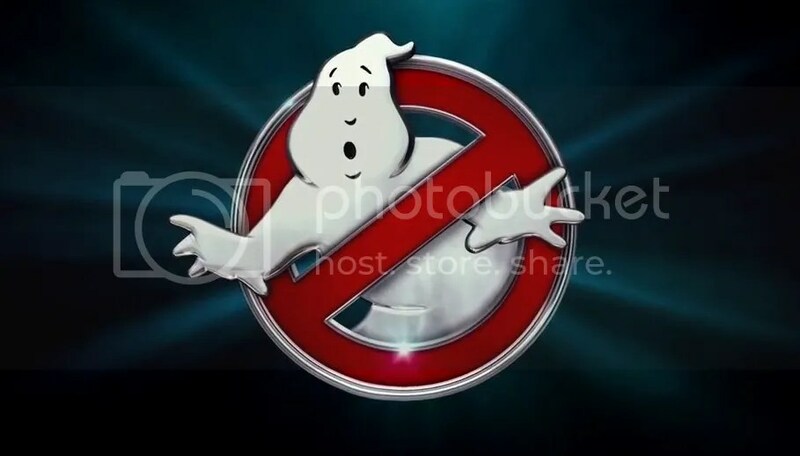 I like how they introduced the classic Ghostbusters logo, and the Stay Puft Marshmallow Man gets a great bit. 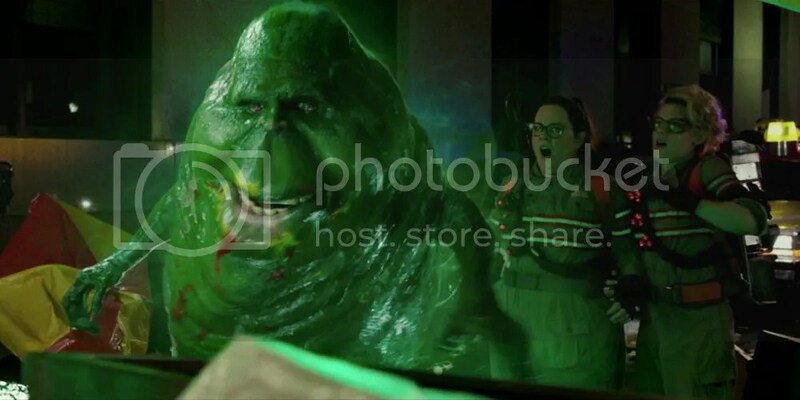 Slimer’s return is kind of dumb, but I liked how they incorporated his big moment into the climax. The classic firehouse gets a great joke in the beginning. And then we have the original actor cameos. They range from great to movie-ruining. The late Harold Ramis gets a classy Easter Egg, though it’s blink-and-you’ll-miss-it. Ernie Hudson fairs the best out of the returning cast, with a solid cameo and joke. Sigourney Weaver pops up in the epilogue during the credits for a weird little bit, and it’s fine. But Annie Potts, Dan Aykroyd and, especially, Bill Murray, grind the movie to a halt. The audience I was with loved each and every cameo, but I definitely did not. And then there’s Bill Murray. Sheesh. 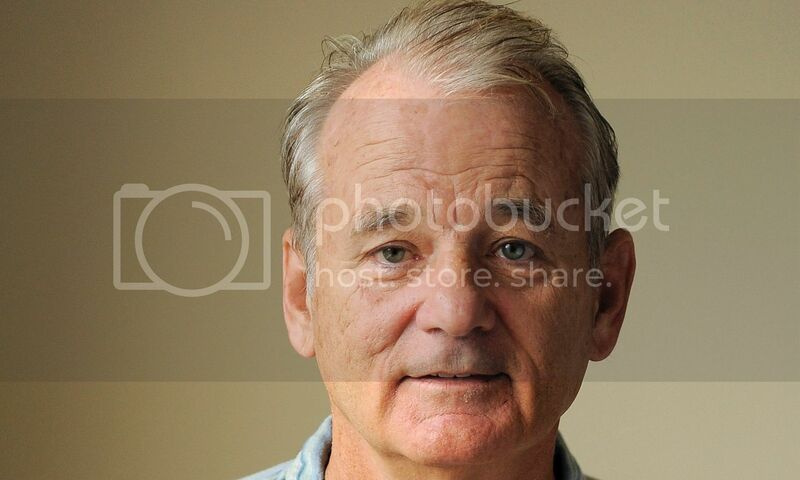 Don’t get me wrong, I love everything about Bill Murray, and he’s usually great in everything he does. But both of his scenes in this new movie grind the whole thing to a painful halt. I winced, I cringed; I wanted him off the screen as soon as possible. In fact, I think Bill Murray’s major scene is the turning point of the film. It goes from a solid, well-made team-building film to a suddenly off-the-rails bout of silliness. Bill Murray’s arrival disrupts the movie’s flow. Murray plays a professional paranormal debunker, who debunks claims of the supernatural. He’s this somewhat foppish old man with a cane and a hat, and he appears on a TV news segment to tut-tut the Ghostbusters’ first public appearance. The scene is set up with Murray off camera, so we know he’s coming, and when he arrives, it’s such a dumb role. Then to make matters worse, he shows up at GB HQ a short time later, demanding proof of the supernatural. This leads to a prolonged scene where he taunts Erin about ghosts until she’s driven bonkers enough to let one out of the ghost trap…and then the ghost kills him. This character really bugged me. Mostly because I just don’t see how this debunker exists in this world. As we saw earlier in the film, the Ghostbusters exist in a world where those ghost-hunter shows on the Syfy Network already exist. I don’t watch those shows, but I don’t think there are professional, gentlemanly debunkers going around on news programs telling everybody that those shows are fake. The public consciousness already knows that ghosts aren’t real and that these are dumb TV shows. And when the Ghostbusters do catch a real ghost, it’s not even really a ghost, as I mentioned before. These might as well be generic monsters that Rowan has summoned from the other side. Erin and her team aren’t proving the existence of ghosts in the real world, they’re responding to this one specific, supernatural threat. The movie is doing a great job putting the team together and having them deal with this threat. But then everything screeches to a halt so that Bill Murray can show up and pish-tosh the whole thing. He strolls around the set and the new Ghostbusters all have to essentially cow tow to him. It’s almost like he’s making them kiss his ring. And then Erin acts out of character to release a ghost just to shut this guy up. And again, I didn’t think the guy should have any sort of authority over them. Who cares that he thinks he’s ‘debunking’ them. But there we go. Sorry for that rant, but it was definitely something I wanted to get off my chest about the movie. It’s nice that they wanted to cameo all the old actors, but sometimes they became a little too much. I was really invested in the world the new Ghostbusters was creating when they suddenly stopped everything to pop in the old characters. They were even worse than the Stan Lee cameos in the Marvel movies. But anyway, I’ve wasted enough time with that. Those are just nitpicks, and sometimes I can really get ranty about nitpicks. They don’t, by any means, ruin the movie. And I am pretty sure that most audience members will absolutely love all the original Ghostbuster cameos. More power to them, I say. But I didn’t like the cameos because the movie was doing such a good job building their own world and characters. I really liked the new Ghostbusters, and their story of coming together was funny, entertaining and more than worth my time. So when the movie decided to hit the brakes for some fan service, I was mostly annoyed that the movie I was enjoying had come to a stop. Fortunately, the movie as a whole survives the multitude of callbacks and the action-packed silliness of its climax. Built on the shoulders of a solid cast of characters, the new Ghostubsters is an excellent and highly entertaining flick that hopefully gets a lot more energy going forward. I wouldn’t mind a new cartoon series, for one. And I could definitely go for a sequel where they take on Zuul and Gozer. Posted on July 15, 2016, in Movies, Reviews and tagged Ghostbusters. Bookmark the permalink. 1 Comment.